We’ve answered some common frequently asked questions (tree climbing faqs) below. Q. 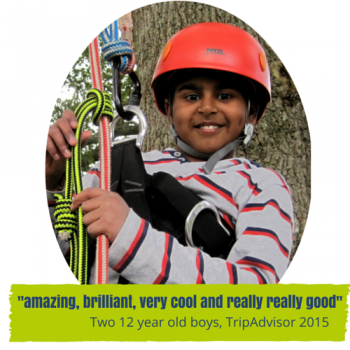 Tree climbing with Goodleaf – is it a high ropes course? A. The short answer is no! Tree climbing with Goodleaf is a unique activity – you’re unlikely to have ever done anything like it before. We climb in one tree, in small groups – it’s different and a more personal experience than a high ropes course, and of course, it’s loads of fun! Q. Why do tree climbers have to be age 8 and over? A. We’ve taken thousands of people tree climbing since 2005. We’ve found that when children are over 8 it’s much easier for them to pick up our technique and they get more from the experience. Obviously we know all children are different and if you’d like further information about this, please have a read here. A. We’re located in a magnificent oak tree in Appley Park, Ryde. We don’t have a ‘centre’, just a lovely tree. You can read more here, but please remember, do not rely on your Sat-Nav to get to us – you’ll need a good old-fashioned map! A. In a nutshell – yes! Recreational tree climbing has an unblemished world wide safety record. All our equipment is CE marked and regularly monitored by an independent assessor. Our staff are trained and supervised by Paul who has completed just about every bit of tree climbing training you could possibly do; here and in the US (the home of recreational tree climbing). A. You can book online or call us on 0333 800 1188. Q. Do I need to be really strong to climb with Goodleaf? A. You don’t need muscles like Popeye to climb trees with us. The technique we teach allows you to use your leg muscles to climb up the rope into the canopy. A ‘can do’ attitude helps! Q. How tall is the tree? A. It’s about 21 metres high – you can climb to about 15 metres. That’s about 3 giraffes standing on top of each other. A. You can do it! You do need to get yourself up the rope but we have made it as easy as possible for you. We have taken lots of larger people tree climbing and they have all got something from the experience – it’s not always about reaching the top, it’s about challenging yourself and giving it a go. Q. Do you have a cafe or somewhere non tree climbers can watch? A. Yes, our tree is in the delightful Appley Park, Ryde, Isle of Wight. There’s a big grassy area around the tree, plus a fair number of cafes within easy walking distance. Plus a lovely sandy beach…and ice creams…and swimming…and play parks…perfect! Q. Is there a loo? A. Yes there are public loos within a 5 minute walk. A. We advise you wear long sleeves and long trousers to protect your arms and legs; the bark on an oak is very scratchy. You also need to wear shoes that aren’t going to fall off when you climb. Q. What happens if I get really frightened when I’m at the top of the tree? A. Don’t panic! You can usually make your own way down with some help and encouragement from us. We can also come and rescue you if needed. A. Well behaved dogs on leads are very welcome as long all our climbers are happy to have them around.